We LOVE Kindermusik Week … is extended! It’s certainly been a great “We LOVE Kindermusik” Week … concluding with 27 of us at a wonderful “Kindermusik with Seniors” PlayDate last Friday. The testimonials that you’ve posted on our blog and on facebook have been so heartwarming and touching. As teachers we are blessed by your kind words and so happy to hear how Kindermusik is making a difference for you everyday. Tuesday, February 28, 9:30 to 11:30 join in the fun of a “Kindermusik FREE Play Day” at our Palmyra location at Trinity United Church of Christ Fellowship Hall, 40 W Pine St. Totally FREE, totally fun and totally open to anyone! Babies, toddlers and preschoolers will enjoy a morning out to run, jump and have unstructured play in a big wide open room with beach balls, hula hoops, tents and tunnels, while moms chat and connect. 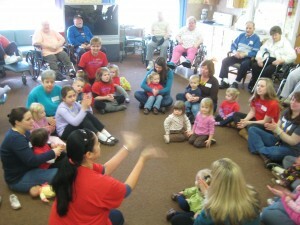 We are celebrating We LOVE Kindermusik Month and how much the community of families has grown. You’ll be able to see all we have to offer and what’s *NEW* for Spring. Rumor has it that a Kindermusik Flash Mob may break out and in Pied Piper fashion engage everyone in singing, dancing and interactive play. So beat the winter blahs and join in this fun event. Admission is FREE but a donation of a canned good, diapers or wipes for the Caring Cupboard in Palmyra would be appreciated. For more information call Carol Anne Friesen at 717-756-8160 or check our facebook page at “Kindermusik with Carol Anne Friesen”. So keep your comments on our blog and on facebook coming. We’ll do our drawing for a FREE Summer session of Kindermusik on Saturday March 3. Mark your calendar for Tuesday, Feb 28 and be sure to let your friends know that they are welcome to attend also.